There is more detail about the sin of the fallen angels in the Book of Enoch. According to it, they repented, but were not forgiven. So, 70 generations from some time point will be the time of consummation. I have calculated this different ways. It seems like the time is about up, depending on what one determines a generation is, and whether the final battle after the 1000 millennial reign of Christ is also counted. But, in general, all along there has been some level of evil in the world. We have witnessed an increase of the occult in the past century. How this will all be accomplished should unfold as time passes. They were ashamed and repentant because God was angry, and they were being punished, not because they saw it was wrong, and rejected the sin. ** Note that they are bound on earth, where humans live. This story, if legitimate, makes me wonder about the “classes” of alien beings we seem to have described today. While I am not an “alien expert,” I read that different alien types can oppose each other. Satan and the serpentine class appear hateful and non-repentant. Then there is a group of “grays” who the governments befriend, to get alien technology. I wonder if there are 2 types of fallen angels. 1. rejected and doomed, bad, but less harmful, “repentant,” fallen angels who are attempting to avoid, further, the wrath of God by “helping” mankind. Maybe they think they can avoid their final destruction through humanitarian gestures. 2. fallen angels, harmful, and committed to evil, unconcerned about the wrath of God on themselves and mankind. They work to destroy the world we know. The idea of repentant devils is a little odd for me. To collaborate with them is still not in God’s plan for believers, no matter what they have to offer. They still have a fallen nature, and lead us quickly into the wrong path. God has provided us with holy angels as guides. He has also provided us with the Holy Spirit, who is there to comfort us, and give us the wisdom of the Word, which is the wisdom of God. In the days ahead, I think we will see more of these supposed fallen, but “helpful” angels (aliens) intervening in world events. We will also see the really nasty ones show up as well. We need to avoid both sets. Salvation is through Jesus, not creatures from the underworld. I am wondering why should these fallen angels repent since it would not change their destiny. Their fate has already been decided and they are living on borrowed time. This seems to show, possibly, that even devils have a conscience, and know what is right vs wrong. They were ashamed, and knew they were wrong. Knowing that punishment was waiting for them, asking for forgiveness was worth a try. Maybe, in their thinking, they could lessen the punishment by asking for forgiveness, or doing a good deed, like helping mankind. Even human criminals have that behavior. They commit a crime, get caught, and then work for a lesser sentence, so they will not have to suffer as much for what they did. Hi everyone. It was not real repentance. They were not sorry for the act but that they could’nt go home afterward. It is the “I am sorry because I got caught” scenario. Obviously, it did not fool God. Interestingly, people do this too. Maybe this is where they got this “spirit of false repentance” from. Fear God only and respect His word for Jesus Christ will come one day to get His overcomers and we shall ever be with the Lord. The devil goes about like a roaring lion to steal, kill and destroy. Many will be fooled and led astray to fall because they are falsely lead by false Christ, lieing demons and lies of false religeons and their teachers. I do not know if these so called aliens are really demons are fallen angels or even if they really do exist. If they do exist they may in reallity be what the Bible calls fallen angels and demons. But that said. I do know this for sure. The Bible is the Word of God and is the truth. One of the best things you can ever do is read the Bible, God’s Holy and Living Word. You will learn about the Lord Jesus Christ YESHUA in His Holy Bible and you will gain knowledge and wisdom and know right from wrong , light from darkness. You will learn about Jesus Christ YESHUA and the truth that He is the only truely begotton Son of God our Heavenly Father YAHWEH. To be saved so we can have a relationship with our Heavenly Father God YAHWEH we must repent of all our earthly sins and ask our Heavenly Father God YAHWEH’S forgiveness and turn away from evil and evil lifestyles. Then we must accept Jesus Christ YESHUA, God’s Son as our Lord and Savior because Jesus Christ YESHUA was willing to bleed and die for all the worlds sins including our own . He paid the sacrifice and laid down His life willingly so that we might have life everlasting . After repenting of our sins and then accepting Jesus Christ YESHUA as Savior and Lord we become saved and washed clean of our sins by His Blood To be able to do this we must really repent of our sins and have true deep faith and knowing with in our hearts and believe deep down that Jesus Christ YESHUA is the Son of God and that He did die for all our sins and that His Holy Blood that He shed for our sins will and can wash all our sins away. This is the only way to the Heavenly Father God YAHWEH. Yes,true repentance of sin and faith in Yeshua our Lord Jesus Christ is the only way and door to the Heavenly Father God YAHWEH ,the Son Jesus CHrist YESHUA and the Holy Gohst the three in one God or as some say the triune God and He is also the only real GOD there is, there is no other . When you get saved the Lord Jesus Christ Yeshua says this about you, my SHEEP know my voice and another they will not follow . Learn to listen for, to hear and know His voice well and be willingly obedient to Him as He leads you by the Holy Spirit and His Living Word since our time here is short. Make the most of it wisely. Jesus Christ YESHUA said He will never leave us nor forsake us lo He will be with us always . Fear not what man can do to your bodies but fear that which can destroy your souls. If any who read this have not repented and accepted Jesus Christ as your Lord and Savior please do so . You do not have to end up like the Fallen Angels . The blood He shed for you will cleanse you from all sin and God will forgive you of all sin if you will accept and believe and have faith that Jesus is the true Son of God and that He died for your sins and paid the price so that you could have forgiveness and live ever lasting. Just ask for forgivensess and repent of all your sins and He will forgive you and will come into your heart and transform you. You will then be the righteousness of God in Christ Thru Jesus Christ blood. Your sins paid for and washed clean and because HE lives you can have assurance you will be like Him and one day you too will have ever lasting life and forever be with the Lord Jesus Christ YESHUA like all the rest of God’s children. Praise the Lord. I thought the Enoch content was interesting. How did you come across the counter evidence about the book? Can you provide a link? Bee could you please elaborate on what you meant by the “satan fallen angel myth”? Because it sounds, at first glance, like you don’t believe Satan is a fallen angel. The main ideas that the book of Enoch elborates on are in the scripture, it seems to just fill in the gaps between the few points mentioned in the bible about fallen angels and the like. Is it possible that the account could be true but GOd saw it unneccesary to be in the complete Canon that we hold today? And I cannot just accept what you claim to of received from the Holy Spirit that it is flat out wrong right off the bat for myslef just yet. I have also come to think that there are 2 groups of fallen angels – the ones that lost the battle in heaven and were cast to hell to wait there judgment/destruction, and the group that was already on Earth (the watchers) or commissioned to deal with Earth/man and left there God-given jobs and sinned – these may be what we now know as demons. It is interesting to notice that in the scriptures no fallen angel or spirit ascends from hell to the surface of the Earth nor does any spirit or demon go from Earth to hell. But instead they wonder frustrated seeking people to terrorize and embody or attach to as though they are doomed to life on Earth. This backs up my thought of 2 angelic falls – the fall of Lucifer (and 1/3 of heaven) and the rebellion of the watchers. Another thought is that demons are the spirits of the Nephilim that died in the flood, perhaps they also could be the spirits of the rebellious angels themselves (they seem to be innumerable). I also personally think that some demonic force poses as what we call aliens and many other phenomenon that distracts us and can draw people away from Christ and Biblical truth and put them in a place of conspiratorial thinking, debate, and fear. what you say makes sense. it is a time to reflect on such things, or be deceived later. Whatever Satan was, angel or something else, he was in heaven, and then fell from there. Also it would mean that if Satan had fallen , it would have happened at the time of the seventy’s commission, which again would mean that Satan was not around in the Old Testament. Satan could have fallen at any time since Eden, or even before it, and still have been present in the OT. He “fell” form heaven to earth, and that is where he has been ever since. Also, I agree that Lucifer is the king of Tyre. He may also have been the King of Babylon. He may have just relocated when one city fell, and then just moved to the other one. He may be the one that was also in the Garden of Eden, but that seems he would have been Satan, then. Eze 28:13 Thou hast been in Eden the garden of God; every precious stone [was] thy covering, the sardius, topaz, and the diamond, the beryl, the onyx, and the jasper, the sapphire, the emerald, and the carbuncle, and gold: the workmanship of thy tabrets and of thy pipes was prepared in thee in the day that thou wast created. Anyhow, I can see where you think, since the Babylonian “king” was already in the garden and fell from there, that he was never an angel, but an evil personality, or one that turned evil, that was in the garden. In 1 chronicles 21:1 we see here The Satan in this verse ‘And Satan stood up against Israel, and provoked David to number Israel’. I think there is a difference between The Satan, The Devil and a satan , a devil. In Judaism ‘Ha Satan’ is an angel who is ‘the adversary’ of man. He stands before God and accuses man of not being sincere in their ‘remembrance and observance’ of the laws of God. The Satan is often compared to ‘a prostitute’ hired by a king to tempt his son. The prostitute does every thing to tempt him … but in ‘the prostitutes’ heart’ she wishes that the son does not fall for the ‘test’. The Satan is an adversary up and until the point where man has passed the ‘test’ so to speak. Hope that helps clarify a few points. Wow that is some far-fetched stuff, I have never heard this before nor does it fit in with any scriptures or examples I can think of, despite your explanations. Jesus did not live from 0-33AD He is from the beginning, he “saw” Satan/Lucifer the angel fall in the beginning! Pherhaps He was telling the 70 that Satan is already fallen and defeated you just have to access my authority like you apparently already have. what you say makes sense. my impression was that Satan fell from heaven at the beginning, which is why he was hanging around the garden. Jesus was speaking in past tense, not present tense. There seems to be a lot of confusion here. Too many issues on the table, perhaps? Question … Are you saying the Satan and Lucifer are the same individual? I only find the name Lucifer mentioned once in the bible. When I go to the original Hebrew, this name is not there. It was put in the translation by whoever did the translating, which was not right. So there is, to me, only one devil, and that is Satan. but since that translation is there like that, people use the name Lucifer synonymously with the devil as well. The reason I asked is I find references to Ezekiel and to Isaiah to speak of The Satan, where there are NO Scriptures pointing to The Satan. So, of course it doesn’t make sense to me. You are correct in saying that ‘the morning star’ … “lucifer’ only appears once, in Scriptures … however The Satan appears many times… but not where the references are made. Why is that?? It is confusing … to say the least. Cute … but why is it you make reference to Ezekiel 28:13? and none are found in Ezekiel nor in Isaiah. So it seems strange (to me) that Scriptures are referred to speak of Satan where these prophetic books do not mention him at all. Either I’m living on another planet … or I’ve missed something, but try as I may I cannot find any reference to ‘The satan by those prophets! 🙂 🙂 I know you did not write the bible but you do write in this post? I can’t stop laughing … well I am sure glad that for you there is only ONE devil and that is Satan. You must be the funniest person I know. hi. Yes’s if u want to take Jesus’s words out of context and say He was refering to some other time then it is still not consistent with other scriptures. satan wants us to believe he is a fallen angel as we then believe he is much less powerful than he is. Thought ; what if Satan is also a type of god, with his own spiritual army and human like seed and this earth really is the battle field. Take the wheat n tares parable as physical seed. Where then do these aliens come from ( not necessarily from space ) why does the Lord say “there are many god’s but I am ure God o Israel ” what if this is a huge chess game. Maybe someone should do a study on “gods” We should start reading the Bible from the beginning as we wld any book and not read on until we understand what we r reading and believe the Word means what it says and not put our own meaning in. It’s not that hard or far fetched as the Lord said ” it is given unto the babes ” Blessings in uncovering the Simple truth. this is just an academic point with me. what difference does it make what kind of creature he was or is? fallen angel or false god? to me it is all the same thing. He is a fallen unholy, evil entity. satan is less powerful than we are, if we are believers, and know our authority. He is under our feet. satan is powerful only because people give him allegiance. M, i just want to thank u for giving us an open non judgemental forum where we can discuss the word. This is one of the few forum’s where i feel most people r genuinely after the truth of the word and r not prepared to accept what we have been brain washed with thru the apostate church system. Bless u ! I think the “tree” theory of eden is quite interesting too. Maybe I could host your post on that? Bee I read the entire article on satan is no fallen angel nearly twice and I found some serious problems with their theaory. I am beginning to realize the Isaiah 14 problem but still have some questions, however – there are a lot of personal opinions and assumptions that are quickly zoomed across without any scripture or explanation. I would like to email you what I wrote on the article. If both are interesting in exchanging emails, I can arrange this offline, so that only the 2 of you see the addresses. Yea sure, I’m for that. I thought we could retrieve each others emails from here but I guess not. great! Looking 4ward to chatting to u Daniel. Hi there! I find this topic really interesting because after realizing I had accidentally written a late-generation Nephilim (what’s the singular?) into my fantasy novel, I started researching contemporary “alien” encounters like crazy and wound up with a lot of questions regarding the place of the different “species” in the cosmic order. One thing I find very interesting is that while there are at /least/ five distinct categories of creatures’ appearances, and while encounters tend to be considered either horribly traumatic or peacefully enlightening…the races involved in each kind of interaction seem interchangeable. (Well, I suppose the scaly kinds are an exception, as they seem to be exclusively cruel, as you mention.) What I mean is that a lot of sites list such and such a benevolent race as being at war with such and such a malevolent race for the fate of humanity, yet in the actual encounter testimonies, person A finds a trusted spiritual mentor in some kind of bizarre insect-headed creature while person B is paralyzed and probed by identical beings twice a month. I should probably be dwelling on whatever things are good and pure and lovely, but sometimes I can be a slave to my own curiosity. I’m not sure if that’s a good thing or a bad thing. I don’t know what my original point was. I think I intended to say something like, “Nooooo, the Watchers aren’t trying to save themselves through community service, they’re just playing a twisted game of Good Cop, Bad Cop with the entire human population so we can be possessable alien-worshipers and diiiiiiie!” but got off my train of thought. Excuse the lack of eloquence and clarity. I’m sorry if this comes across as long-winded, pointless spam. I do not know the precise nature and history of the Angry Black Voids that are usually present to mock me during sleep paralysis. However, on one occasion, though I was not at an angle where I could have reasonably seen it physically, instead of voids there were human-looking beings standing by my floor-mattress holding a thick stack/booklet of papers. The leader warmly yet silently invited me to study spirituality with him(?) so that he(?) could show me how limited Christianity is. He(?) radiated pure friendliness. However, I was deeply offended by both the fact that I was unable to move from head to toe AND that they dared to try to propagandize me on top of it, so I commanded them to leave in Jesus’ name and went back to sleep. (It was almost a reflex–it had by then become my automatic policy in case of sleep paralysis to use the Name of Jesus immediately and with as little panic as possible.) Nothing else of interest happened after that, but it kind of cemented my “They’re just demons after our sooooouls!” mentality toward all “visitors”. There are only 2 kinds of spirits – holy and unholy (evil). How friendly they seem to be is irrelevant. These unholy creatures are only out to possess you, and control you. It sounds like your fascination with the topic invited a few your way. Only the name of Jesus will get rid of them. Christianity – made by man – has flaws….but the pure faith Jesus brought was not like what you might see today. To return to the pure faith, read the bible, and pray for insights. 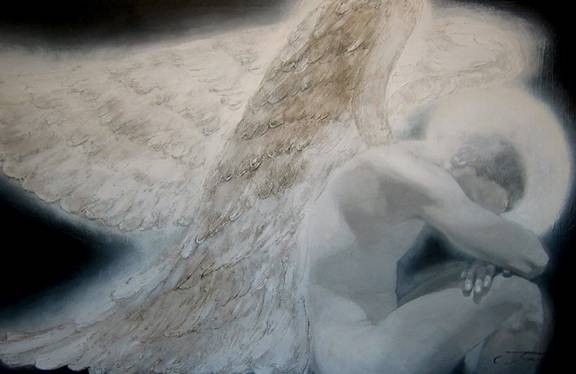 re: some of your questions…..All heavenly creatures were created to be beautiful……angels lost their glory and beauty when they fell from heaven. The creepy ugly appearance is all they have left. This is their true nature. However, they can masquerade as angels of light and appear beautiful, but this is a delusion- deception. When confronted, they return to their true appearance. It is my understanding the main reason for the flood is that human DNA was being changed. We call it the Nephilim. They are the offspring of fallen Angels, and humans. Most of the fallen Angels are chained underground, as they are to powerful fo be among humans. Lucifer/Satan is given respite until Judgement day. I think the Book of Jubilies reads this way. As Lucifer/Satan/the old Dragon hates mankind because we were made after him, and were given grace at Eden, he roams the earth as a Lion seeking to mislead as many humans away from G-d’s love as he can. We see the same thing happening now as we did before the flood. Aliens taking humans for seamen, eggs, and planting embroys into females across the whole planet. The hybreds are the Nephilim, as the were never ment to be created by G-d. The spirits of the Nephilim from the flood are what we call evil spirits, or demons. Satan surely knows his time is short, or he would not be doing this again. He is the smartest of all creation, and understands the Bible better than anyone. The rebirth of Israel is his cue to pour it on. The above video is about the Watchers….thought the video would pull up.. It is the nature of men to be deceitful, greedy, intolerant, hateful and cruel. They don’t need to be supernaturally influenced to walk in darkness. But then again, it is also their nature to blame their short-comings on someone else. If they blame someone or something else for their sins, how can they be honestly repentant for their deeds? It is also the nature of demons to be deceitful as well. All are responsible for their behavior. There is also a power difference. I as an adult have much influence over the thoughts of a 3 year old. So if I tell the child to do something wrong, I am more responsible for the outcome than he is. Same with the supernatural. It has more responsibility because it knows more, and has the power of influence over someone who is not as knowledgeable as the supernatural being is. If a sin is committed because one is being influenced by a demon, that sin is mitigated (though not necessarily forgiven) because of that influence (it was not an act of free will or of one’s true nature). There are many beings upon this world that are pretending to be that which they are not (both “human” and paranormal). World War II and the holocaust are two examples of deeds that they have influenced. There have been many others, such as mothers killing their children to “save” them from the devil. These are tests by these beings to see how they can use telepathic communication as a weapon (even to the point of driving people mad). It is very easy to believe that a voice speaking inside your head that claims to be an angel or the voice of God, truly is what they claim. Having God speak to you is a bit like winning the lottery (unlikely), having a lying sack of crap talk to you is like loosing it (very likely). Still, the influence they have is primarily just words (lies) though can can project a bit of emotion as well. These beings have desecrated sacred technologies in doing what they have done. This world shakes because they doubt the power of God, and do not believe that the fate of their race and their world rests in His hand. I personally believe that, as a race, they are psychopaths and should be destroyed, but that decision is God’s and I will abide by it. I suppose the point of all this is: judge the messenger by the message, and keep in mind that God rarely speaks to mortals. Thank you I was wondering. It does help explain MANY things. I must find a source of Book of Enoch to read for reference. it is available as a pdf file….can get it free on line or I can send you a copy. Devils cannot repent. They rebelled and, being pure intelligence, that’s permanent rebellion. That’s probably why this isn’t amongst the Bible’s books, if this stuff is in Enoch, though it may not be condemned, either. The fallen just hate; those angels who stuck with God are forever on His side. Those souls in Hell will never want to be with God, either.